The Carolina Company was incorporated in 1663 to colonize the land in North America that was south of Virginia and north of the Spanish territories in what is now Florida. It took its name from the monarch, Charles I (Carolus in Latin), and the patent was issued to a group of eight Lords Proprietor, headed by Anthony Ashley Cooper, better known as Lord Shaftesbury. In 1669, in preparation for putting the colony on a better footing, the Company ratified these Fundamental Constitutions. The authorship of this text has often been assigned to John Locke, and the text below is taken from an eighteenth-century edition of Locke’s writings. But it is more likely that the Constitutions are a collaboration between Locke and Shaftesbury, who was his employer, with other members of the Company having input as well. It is a corporate document, its “author” being more the Company itself than any particular member. 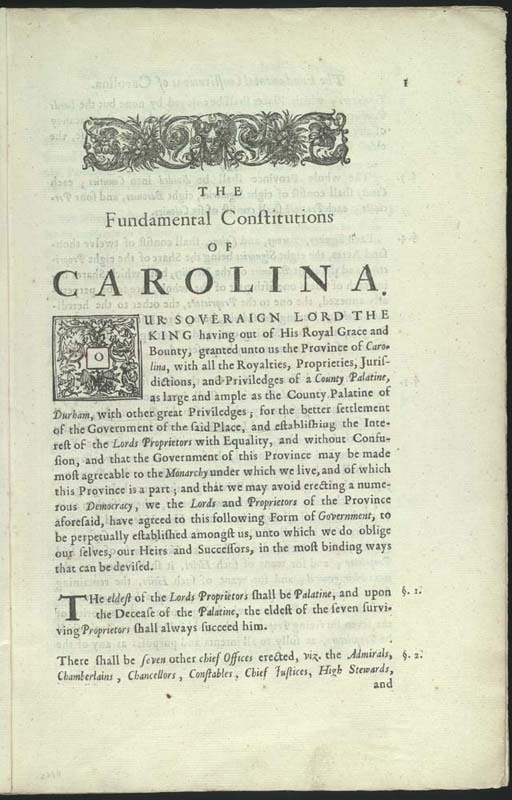 The Constitutions lay out a surprisingly feudal social structure for the colony, with a strict hierarchy of ranks (palatines, baronies, landgraves–the titles differed from those in use in Britain by design); for readers who come to a work associated with Locke with memories of his Second Treatise of Government, which calls for a society built on contract and consent, the difference between that and the Constitutions’ feudalism is startling. The Constitutions also call for chattel slavery, anticipating a workforce imported by force from Africa, and protect the “absolute authority” of free white owners over their “negros.” This too is a bracing reminder of how deliberately and thoroughly slavery was woven into the institutional structures of the English colonial project. Ten. The first landgrave and caziques of the twelve first counties to be planted shall be nominated thus, that is to say: of the twelve landgraves, the lords proprietors shall each of them, separately for himself, nominate and choose one; and the remaining four landgraves of the first twelve shall be nominated and chosen by the palatine’s court. In like manner, of the twenty-four first caziques, each proprietor for himself shall nominate and choose two, and the remaining eight shall be nominated and chosen by the palatine’s court; and w hen the twelve first counties shall be planted, the lords proprietors shall again in the same manner nominate and choose twelve more landgraves and twenty-four more caziques, for the next twelve counties to be planted; that is to say, two-thirds of each number by the single nomination of each proprietor for himself, and the remaining third by the joint election of the palatine’s court, and so proceed in the same manner till the whole province of Carolina be set out and planted, according to the proportions in these fundamental constitntions. Fortv-seven. The proprietors’ courts have a power to mitigate all fines and suspend all execution in criminal causes, either before or after sentence, in any of the other inferior courts respectively. Ninety-five. No man shall be permitted to be a freeman of Carolina, or to have any estate or habitation within it, that doth not acknowledge a (lod, and that God is publicly and solemnly to be worshipped. One hundred and eighteen. VVhatsoever alien shall, in this form, before any precinct register, subscribe these fundamental constitutions, shall be thereby naturalized. One hundred and nineteen. In the same manner shall every person, at his admittance into any office, subscribe these flmdamental constitutions.